The decision this week by Israel’s cabinet to bring as many as 8,000 additional Ethiopians to Israel over the next four years and then close the door on mass Ethiopian aliyah has a familiar ring to it. That’s because it has happened several times before. In 1991, 1998, and 2008, Israel declared an end to mass Ethiopian immigration, only to reopen the gates after intense lobbying and pressure by advocates for Ethiopian aliyah. On Sunday, again after dogged lobbying by advocates – including a former president of the North American Conference on Ethiopian Jewry, or NACOEJ; a former Israeli Supreme Court justice; Israel’s Sephardic chief rabbi; a former Canadian justice minister; and myriad other figures inside and outside the Israeli government – the Israeli cabinet again voted to expand Ethiopian aliyah. This time, however, it will be different, promised one of the main advocates for the aliyah, Joseph Feit, the former president of NACOEJ. His New York-based organization advocates for Ethiopian aliyah and runs aid compounds in the Ethiopian city of Gondar that provide some food, schooling, and jobs to the would-be immigrants to Israel. “Everybody’s working in cooperative mode,” Feit said in an interview from Israel a day after the Israeli cabinet voted to expand by as many as 7,846 the number of additional Ethiopians who will be allowed to immigrate to Israel under special criteria established for the so-called Falash Mura – Ethiopians who claim links to descendants of Ethiopian Jews who converted to Christianity generations ago, but who now are returning to Jewish practice. What’s different this time, Feit said, is that NACOEJ has agreed to withdraw from Ethiopia and cease all aliyah advocacy if the additional Ethiopians are brought to Israel in accordance with the government decision at the rate of 200 per month. Under the agreement, NACOEJ will turn over operation of its aid compounds in Ethiopia to the Jewish Agency for Israel three months after the aliyah begins, and NACOEJ will end all its activity in Ethiopia and aliyah advocacy once those among the 8,000 who meet Israel’s criteria for aliyah are brought to the Jewish state. It’s not the first time such an agreement has been reached. An identical deal was proposed in 2003 and signed in 2005, and since then thousands of Ethiopians have been brought to Israel and been made citizens. NACOEJ did not cease its aliyah advocacy, however; Feit said it was because the 2005 agreement was never implemented. He said the Jewish Agency never took over the aid compounds, and the Israeli government dragged its feet on bringing the Ethiopians, stretching out the aliyah for years in fits and starts. In addition, Feit said, several thousand Ethiopians who were supposed to be considered for aliyah were never included in the immigration. Adjusting for natural growth, those are the 8,000 or so Ethiopians in Gondar seeking to make aliyah, he said. But a former Jewish Agency official who headed aliyah operations in Ethiopia for four years disputes that notion. Ori Konforti said the numbers are constantly changing in a ruse to keep Ethiopian aliyah going as long as possible. Rather than capping Ethiopian aliyah, the government’s decision this week actually sets a dangerous precedent by potentially opening the doors to even more Ethiopian immigration because it dramatically eases the criteria Ethiopian petitioners must meet to qualify for Israeli citizenship, Konforti said. For the first time, an Israeli government will be allowing Ethiopians to apply for aliyah who were not counted in the Efrati Census of 1999 – a tally of would-be Ethiopian immigrants carried out by a former director of Israel’s Population Registry, David Efrati. Until now, any Ethiopian seeking to immigrate under the special criteria for Falash Mura had to be on the Efrati list. Now, however, Ethiopian petitioners who were not on the list but have Jewish lineage on their mother’s side will qualify for aliyah. Rabbi Menachem Waldman, director of the Shvut Am Institute, which is involved with Ethiopian aliyah and preparing the immigrants for conversion to Judaism, said that in all likelihood no more than 6,500 additional Ethiopians will come to Israel as a result of this week’s decision. That number represents those who qualify for aliyah but were not counted on the Efrati Census because they were in rural villages where the census tally was imprecise. “We said all these years that there were a certain number that were not in the census,” Waldman told JTA. 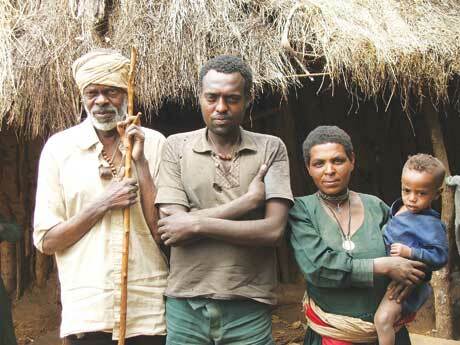 He estimated the number of Falash Mura villagers who were not counted by the Efrati Census at about 5,000. The figure of 8,000, he said, includes those villagers who migrated to Gondar between 2003 and 2007 and people from the Efrati Census whom the Israeli government mistakenly failed to verify for aliyah eligibility, plus natural growth due to births and marriages. “With this decision, I think the government went to the maximum,” Efrati, who conducted the original census, told JTA this week. The 8,000 figure, he said, was the maximum number agreed upon by Ethiopian families in Israel, public figures, advocacy groups, their American Jewish sponsors, the Israeli government, and the Ethiopian government. That doesn’t mean there aren’t others in Ethiopia – a country of 88 million whose population believes it is the product of the offspring of an illicit union 3,000 years ago between King Solomon and the Queen of Sheba – who may be eligible to make aliyah, Waldman acknowledged. Any Ethiopian who can prove eligibility for aliyah under the standards of the Law of Return – practically impossible for the Falash Mura – may immigrate to Israel regardless of this decision. The question at the heart of the dispute over the aliyah of the Falash Mura is how many remain in Ethiopia, and therefore whether the aliyah will ever end. Opponents claim the number changes constantly because Ethiopians desperate to escape Africa’s poverty for Israel’s comforts are manipulating the immigration system. Advocates claim the numbers have changed only due to natural growth and to earlier Israeli government mistakes in counting the Ethiopians. They say a combination of factors will help make sure that this time the Ethiopian aliyah ends for real: the Israeli government and the advocates agreed on a cap; to be eligible, would-petitioners had to have moved to Gondar by 2007, so newcomers cannot be added; the advocates have agreed to cede operations in Ethiopia to the Jewish Agency, which will shut down the aid facilities and school once the eligible petitioners are brought to Israel; and the Ethiopian government does not want mass emigration to continue beyond these agreed-upon 8,000.